This month's staff feature is our newest staff member, ranger Ryan Andraos. 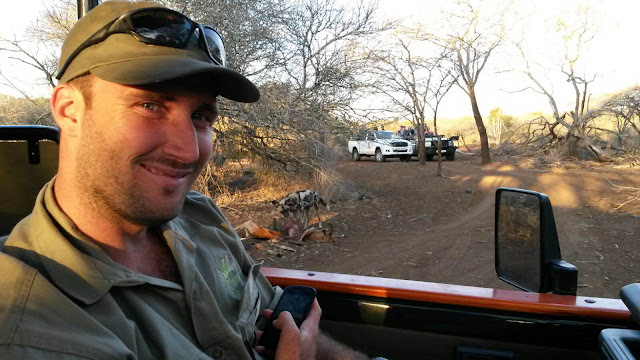 Ryan has come to us with some great experience and a whole lot of passion for the bush. We get to know a bit about him in the following interview. At my previous lodge I started out as a Field guide and History Battlefields guide but I was tempted into management and thus began managing the lodge and Environmental Education Centre. This meant long hours in admin and the other laborious indoor tasks that come with management so I decided to appreciate the experience but move on and get back into field work. I love Zululand, it’s a place with so much history, culture and wildlife and so when I saw an ad for a position at RRL I knew it was where I wanted to be! What aspect of your new position are you most excited about? Sho there are so many… Being in the bush, interacting with different people on a daily basis, portraying our beautiful country in a positive light to international tourists and getting to see some incredible animals and their behavior. It’s like one of those adventure books you read as a young kid, full of excitement and exploration! What is your favorite part of being a game ranger? You learn something new every day! Not even the best scientists and researchers ‘know it all’, so I learn things from other rangers, from what I see on a day to day basis and sometimes I even learn new things about the bush from our guests. Our jobs are not jobs, we live for a passion and it makes the long hours all worth it! What advice would you give someone coming on safari for the very first time? Appreciate the landscapes and the simplicity of life in the bush, too many tourists put high expectations on themselves and their guide to find Big 5 and elusive animals, this is understandable but I think it’s also a great pity. The Zululand region is absolutely beautiful, the views and vistas, sunrises and sunsets, colours and sounds, night sky and distant mountains all make for an incredible experience and are undoubtably good for the soul. These wild places are few and far between and need to be appreciated and taken in. I think it’s important for any person to get into the bush and just be; no schedules, phones, music, etc. it’s an amazing experience and immensely healthy for us but seldom done or appreciated. Do you have a favourite animal to view on game drives? If so, why? There are lots! Every animal brings a different act to the play that is the African Bush! White Rhino’s introduce peace and tranquility, Black Rhino’s are all about enthusiasm and energy, Elephants are about intelligence and care for one another, it’s really important to appreciate each animal and their separate personalities. 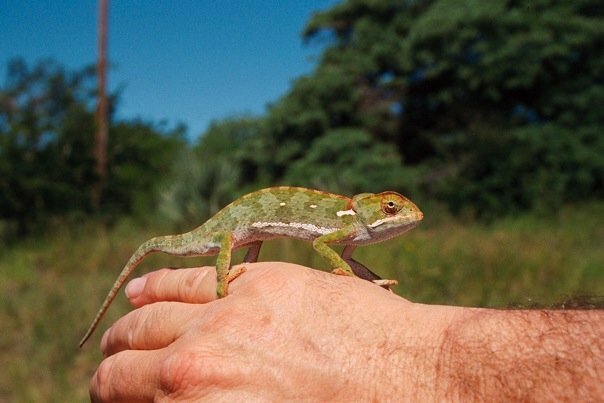 But I think my best animal to view and perhaps even touch on a game drive is a Chameleon. Guests go crazy when you spot a chameleon and pick it up and give them a chance to see it up and close or even touch it, it’s often a memory they will cherish for a long time! Game drives often lack that practical interaction and so I try to bring things into the vehicles, small organisms, dung, bones etc. Chameleons are great, they are colourful, very unusual, intricate and rather harmless, so my highlight is finding one of these little guys for guests. What do you love best about living in the bush? The lack of restriction, freedom, wide open spaces and the people. I have lived in the bush for 6 years now and I don’t think I could return to suburban life. I love hiking to the tops of mountains, driving my motorbike on back roads, trail running along cattle tracks, swimming in rivers and so much more. How could this not sound appealing to people!? And as silly as it sounds I love living in the bush because of the people, the bush attracts some incredible people, bush people are fun-loving, laid back, have an intricate care for the environment and generally always keen for a little fun and adventure. Living in the bush can be tough but I believe the pros far outweigh the cons!